Feathers are what make birds unique. There is an enormous variety of shape, colour, and function of feathers in the bird world. Feathers are part of the fascination of birds. Feathers are easy to take for granted, but in reality, they are an incredibly complex piece of design engineering, essential to the well being of birds. Feathers are made of a type of keratin, similar to hair but harder. 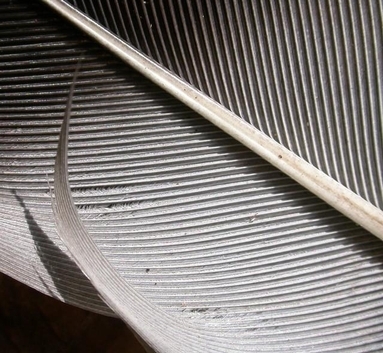 Bird feathers consist of a shaft with rows of fine filaments on each side. The fine filaments themselves have even finer filaments branching from them. The linking between these very fine filaments gives flight feathers their strength. In the down feathers, the filaments are loose and fluffy and thus are able to trap an insulating layer of air close to the body. Not only do feathers help with flying but they also protect the bird from cold and water. For a bird to survive the feathers need to be in first class condition. Birds spend time cleaning and oiling their feathers, but in time feathers get worn and need to be renewed. Summer is the time of year when many birds, having raised their young, go into the complex process of renewing their feathers by moulting them. When birds are moulting they are vulnerable, particularly when they are shedding flight feathers and growing new ones. Often at this time birds do not draw attention to themselves but make themselves scarce. Feathers can make up as much as 12% of a bird’s weight so it takes a lot of energy to replace them. Birds have varying amounts of feathers. For example, a Swallow has about 1,500 and a Mute Swan about 25,000. Birds have different densities of feathers, with some Penguins having about 100 per square inch. In the UK, the Dippers have much denser feathering than other small birds to help them cope with the chill of mountain streams in which they hunt for their food. Most birds are able to fly when moulting, because they shed their flight feathers in sequence so that only a few are missing at any one time. Ducks and other wildfowl lose all their flight feathers at once and become flightless. Male ducks moult their body feathers before their wing feathers so that they have a more camouflaged female appearance when they are flightless. Most birds take a month or two to complete their moults, but some small resident birds like Greenfinches can take up to 100 days. On the other hand long distance migrants, such as Swallows, moult most quickly, as they need to have good flight feathers for their long journeys. Young birds can have several moults, from their downy stage into juvenile plumage and into their first year plumage. Adult birds moult at least once a year, but many birds renew their feathers twice a year. Moulting does result in changes of appearance, while some are subtle others are obvious, like the Black-headed Gull which loses its dark hood for the winter and regains it for the breeding season. The next time you see a feather blowing in the wind or lying on the shore pause and think about its significance to our feathered friends.